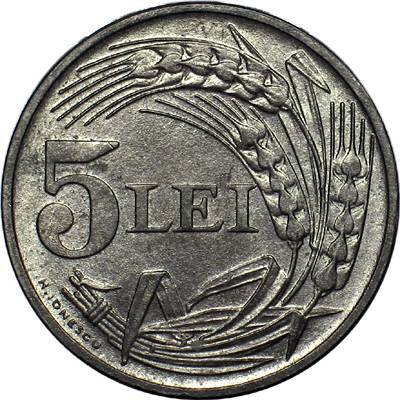 denomination "5 LEI" and wheat ears. Along the rim, under denomination 5, is placed H. IONESCU, the engraver's name. 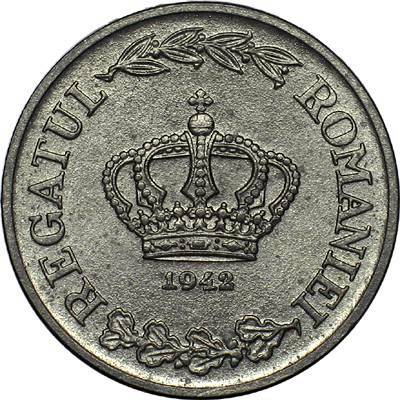 inscription "REGATUL ROMANIEI" meaning "KINGDOM OF ROMANIA", crown, year 1942, a laurel branch above and an oak branch below. This coin was struck at Berlin, in Germany. It was also struck in 1943, but all the coins show the year 1942. The other zinc issues - 2 lei 1941 and 20 lei 1942, 1943 and 1944, presented on the previous and the next page, were struck at Bucharest Mint. 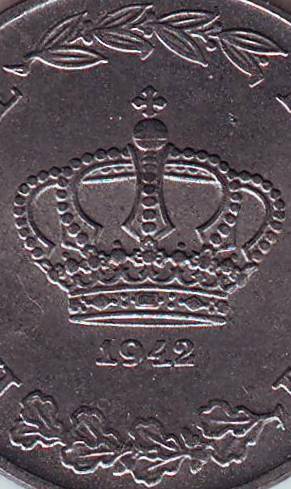 The detail picture of 5 lei 1942 coin at right appears on the site thanks to the kind permission of Mr Cristian Ciuplea.